Hello Peter, Here's another one of my finds from yard sales. It's like a light green with blue dragon bowl. 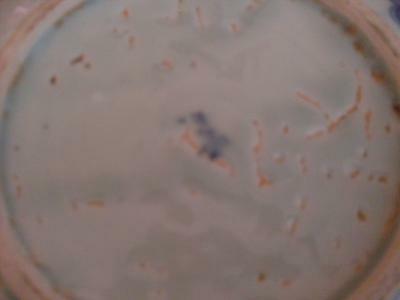 Blue mark is faded so it's really hard to see what it says. THANK YOU for all that you do. 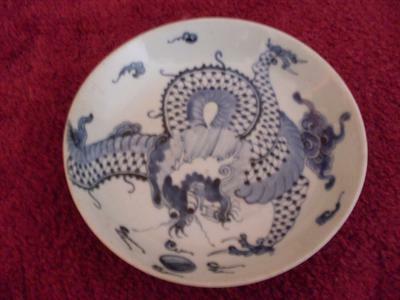 Comments for Dragon Rice Bowl? Hi Peter, And yes the celadon glaze is all over. Well I know you know more than that person. And yes the tail does go around to the side of the bowl. And as far has the toes go I didn't know if it had anything to do with it. Thank You for helping me. 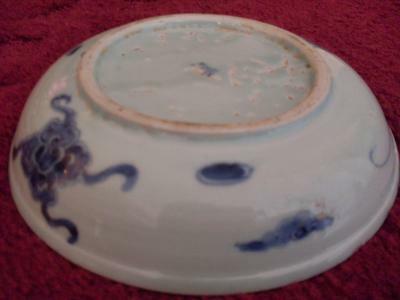 This said, I wonder if the celadon glaze is only on the underside; the pictures don't show this clearly. This decoration is what the Chinese call 過牆龍 (dragon over the wall), a fairly common decoration. The dragon is painted on the interior, while part of the tail should be outside, under the rim (not visible in these pictures, though). Many of these decorations were made in Dehua kilns. The one or two character mark is also found on Dehua wares. Dehua plates usually have a lip at the underside of the rim. And, the foot rim is typically rounded and lower than with any other Chinese kilns. 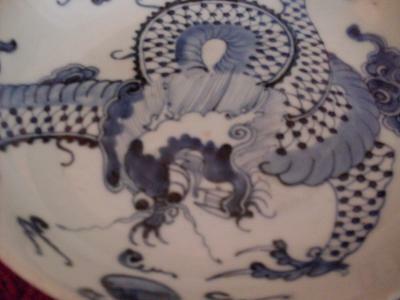 The rim in fact is the only thing that has some similarity to Japanese porcelains. The decoration and all other factors point to Dehua. Looks as if it were an item made at Dehua kiln, in Fujian province. Probably 19th century, judging by these pictures.